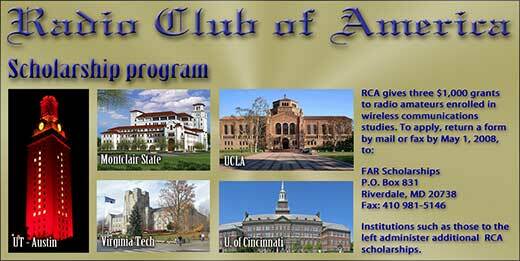 The FAR scholarship application process is open to all licensed radio amateurs worldwide. Visit the FAR scholarship web page to learn how to apply, and pass the word to those who may know students who could benefit from RCA’s scholarship program. Patrick Mohr KC7ZZV is an 18-year-old who was home schooled but has taken classes at community colleges for several years. At the time of his scholarship grant, he was expected to enroll in Oregon Tech, majoring in computer science and engineering, with interest in both hardware and software development. He holds a General class license and has been licensed since 1998. He works VHF FM and is a member of the Link-ups KN7XXM Radio Club and the Clackamas Amateur Radio Emergency Services, and is active with ARES and public service events. Daniel Freidrichs K0IPG is a 21-year-old senior studying electrical engineering at South Dakota State University. He holds an Extra class license, and helped his younger brother to also become licensed. He is a past president and current member of the board of directors of the Le Mars Community ARC, and a member of the Brookings Radio Research Club. He is interested in home-brewing and has constructed three complete 2m repeaters from Motorola surplus as well as antennas and other items. Stephen Sciarini KC8IDJ is a 20-year-old senior attending the University of Akron with a major in electrical engineering and a minor in computer science. He holds an Extra class license and hails from an all-ham family. He is presently active on PSK31, packet, and QRP on the HF bands and 2 meters. He is a member of the Massillon Amateur Radio Club and enjoys field day and fox hunts, and has been active with emergency communications, both exercise and real. This entry was posted on Wednesday, December 26th, 2007 at 1:14 pm and is filed under RCA news. You can follow any responses to this entry through the RSS 2.0 feed. You can leave a response, or trackback from your own site.